Our molding process uses the best quality 3k carbon fiber weave to create forms that are shapely, lightweight, and extremely strong. The first step is to sand away the damaged carbon, including the surrounding 1”-2” area. This removes any stress risers and prevents them from creating fractures again. Second, the new carbon is laid down; the laminate is laid by reading the original fiber orientation to match with the new layers. After the new carbon layers are laid, the area is compressed with tape to set. For fractures around lug areas or a unique shape, we make a custom mold to adequately and evenly apply pressure. Frames with catastrophic damage oftentimes require reinforcement from the inside out with an insert; often made of foam or carbon depending on the nature of the damage. Thirdly, the area is built back up and sanded one final time to meet the same contours as the original frame. We do our best to match the original carbon weave but sometimes it’s just not possible to match the weave exactly. This is only noticeable if the finish is left unpainted or just cleared. Our testing has found that the repaired areas meet or exceed original stiffness of the original tubing. The carbon pattern will not perfectly match the original. This will only be apparent on frames that are unpainted or have a translucent finish. Blemish, $100 - These cover nicks, gouges, or small worn areas. Generally, there is no cracking yet. Fracture 1, $195 - Fractures in the carbon; damage is less than 1/3 the diameter of the tube or 1” long. Fracture 2, $295 - Fractures greater than 1/3 the diameter of the tube that are soft to the touch or need extra reinforcement will require a full wrap of the tube. 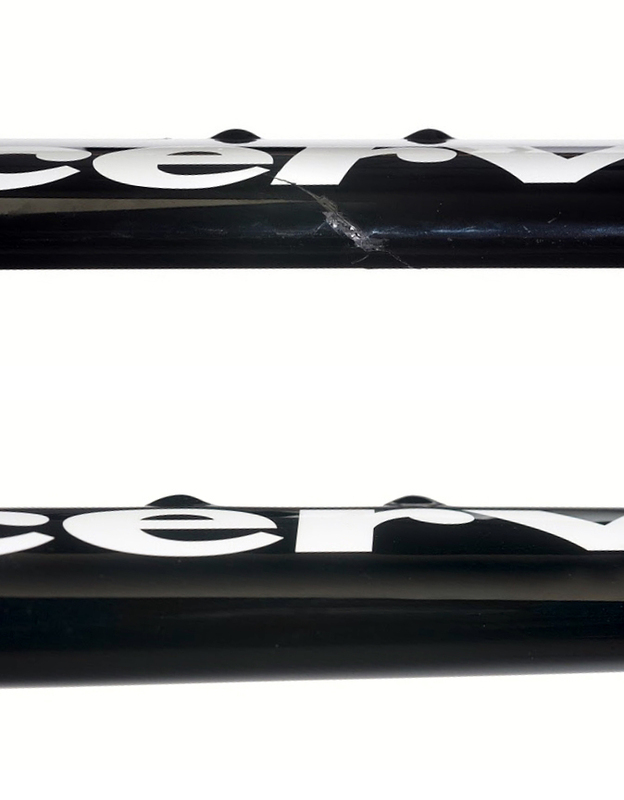 Catastrophic crash, $350-$650 - Major damage, separated or missing carbon holes punched into tubes. This would include seat mast re-attachment. When wanting a catastrophic repair its always best to send in picture for accurate estimate. We can replicate any original tube shape. Some repairs, however, require additional reinforcement which may result in a slight dip or rise at the edge of the repair area. We do our best to sand these flush yet there may be times where there may be a slightly thicker appearance which cannot be avoided.